There are a myriad of apps, software programs, and online tools for biblical studies today, and more being created all the time. This article provides descriptions of the most notable of these with information current as of July 2016. Which Bible study tool or tools you should use depends on three factors: what devices you want to use for Bible study, what kind of study you want to do (for example, studying the Bible in its original, ancient languages), and how much you can afford to spend. This article reviews the apps and programs that are completely free, or mostly free with some optional paid resources. In a separate article, I review professional Bible study programs of varying costs that are much more advanced in their features. Five of the many completely free tools I have reviewed are rich enough in features that I would judge them to be good or even very good. Perhaps the best of these is the STEP Bible, produced by Tyndale House in Cambridge; it may be used online or downloaded to be used in your browser even when offline. The quality of the STEP Bible is outstanding: it is the work of a team of respected biblical scholars, has the best collection of biblical texts in the ancient languages of any free product, and can be used to do surprisingly complex, helpful searches. Tyndale House is still developing STEP Bible apps for handheld devices. If you are happy doing your serious Bible study on your computer, the STEP Bible is in my opinion the best completely free product you can use. Two other completely free Bible study tools are online only: Bible Hub and Lumina. My personal opinion is that Lumina’s quality is somewhat better while Bible Hub shines in sheer quantity of resources. I would recommend bookmarking Bible Hub on your laptop simply for the large number of English translations, commentaries, and other reference works it has. The other two tools can be downloaded and used on multiple devices. Interestingly, they have very similar names: CrossWire’s SWORD Project and e-Sword. CrossWire is available for more platforms (e.g., Android) than e-Sword, but e-Sword has more depth of resources. Either of these programs will take somewhat more time to learn to use than Bible Hub or Lumina, but they can do much more than those websites can. Honorable mention also to Study Light, which is a free online Bible study site, and Blue Letter Bible, another such site that also provides downloadable apps for iOS and Android devices. Both of them are pretty good but in my opinion not quite at the level of the five previously mentioned. Blue Letter Bible is especially popular and I expect some people will be disagree with my assessment of it. Again, all of these tools are completely free, so you can visit their websites, try the ones that look interesting to you, and decide for yourself. Any of these tools would be very helpful to people without formal education in biblical studies (including the biblical languages) who want to study the Bible. What follows is an alphabetical list of the tools with detailed descriptions of each. Website with free resources online. The site does not look like much, but it is actually quite functional and useful for a completely free site. View multiple English versions (ESV, HCSB, KJV, JPS, NET, NIV, NLT, etc.) on the same page, or multiple public-domain commentaries on the same passage (Barnes, Calvin, Cambridge Bible, Clarke, Expositor’s [early 1900s], Gill, Henry, Jamieson-Fausset-Brown, Keil and Delitzsch, Scofield notes, Wesley, etc. ), some of which are not usually found in Bible study tools. Its library of literature includes quite a few valuable older books all in one place by such authors as Arminius, Calvin, Chesterton, Paley, Ramsay, and Spurgeon. Bible Study Tools has the best collection of English versions of the OT Apocrypha I’ve seen (some eight versions) and a large library of older literature by such authors as Bunyan, Edersheim, Finney, Kuyper, Machen, Moody, Andrew Murray, Augustus Strong, and Warfield. An interlinear provides an English text, a transliteration of the Hebrew or Greek, and the Hebrew or Greek text itself, with the part of speech noted and Strong’s dictionary numbers to access more information. Remarkably, this includes both concordance information (use with extreme caution if at all) and entries from recognized lexical references (Thayer’s for the NT, and even better BDB for the OT). Click on the Hebrew or Greek “study Bible” and the original language text is shown; mouse over a word and grammatical information appears. Parallel Greek texts can be viewed, including the SBL, WH, Majority Text, Tischendorf, TR, and others. Also available free are an online atlas and a Bible encyclopedia, the old ISBE. Free collection of Bible translations, including most of the widely used English versions (ESV, HCSB, KJV, LEB, NASB, NIV, NKJV, NLT, and NRSV), along with the SBL edition of the Greek NT (apparently no Greek text for the OT). The Hebrew OT text or Greek NT text can be seen in an Interlinear Bible; a click on one of the Hebrew or Greek words, each keyed to Strong’s dictionaries, brings up information about that word (a transliteration, pronunciation help, verses where it is used, etc., but no grammatical information). Listen to the Bible in any of four popular formats and in one of three English languages. Have a daily Bible verse delivered to your email. Choose from several Bible reading plans. Also available are various reference and theological works, mostly in the public domain (John Lightfoot, Jamieson-Fausset-Brown, Gill, Henry, Robertson’s Word Pictures, Scofield Bible notes, Wesley’s Notes, the old ISBE, Josephus, the church fathers, Calvin’s Institutes, etc. ); a notable more recent reference is Baker’s Evangelical Dictionary of Biblical Theology. An admirable free resource with a few noteworthy references (notably Robertson and the dictionary just mentioned), but not of significant help for those interested in working directly with the original languages. A free Bible Study Tools app for iPad and iPhone is also available (https://itunes.apple.com/us/app/bible-study-tools/id396906089), but at this point it does not have nearly the features or functionality of the website. One of the most popular Bible study websites, which allows free online searches for verses or words in the Bible, comparing multiple translations (notably the ESV, HCSB, KJV, NASB, NET, NIV, NKJV, and NLT), and studying the OT in Hebrew and Greek, the NT in Greek, and the Bible in Latin. Next to each verse is a Tools button with the choice of an interlinear, parallel versions, cross-references, commentaries, dictionaries (notably the old ISBE), or Miscellaneous (images, maps, timelines, music, and word clouds). The interlinear identifies each Hebrew or Greek word with a transliteration and audio file of its pronunciation, gives its number in Strong’s dictionaries, and will parse the verbs. Clicking on the Strong’s number leads to additional information including an entry in Gesenius’s or Thayer’s lexicon and a list of all of the verses in which the word appears. “Commentaries” includes materials of various kinds including verse-by-verse commentaries (Henry, Jamieson-Fausset-Brown) but also works on specific books, passages, or topics (including an earlier version of my own outline study on the Trinity). Additional resources include a harmony of the Gospels, charts and outlines (OT quotations in the NT; names of God in the OT; tables of miracles in the OT, in the Gospels, and in Acts; Jewish observances; etc. ), timelines, maps, and more. BLB also makes available apps for iPhone, iPad, and Android, and a CD can be obtained for permanent installment on one’s computer (a donation is requested). Free downloadable Bible study software developed on an open-source basis. The SWORD Project is a cross-platform program with an electronic library of Bibles, commentaries, maps, and other resources in different languages. English Bible versions include the ESV, JPS, Lexham, NET (with limited notes), and a variety of lesser and obscure versions. Greek texts include several editions of the GNT (including the SBL, TR, WH) and one of the LXX (Rahlfs). Hebrew texts include the Aleppo Codex and the Westminster Leningrad Codex. Other resources are mainly older ones in the public domain, including commentaries (Barnes, Clarke, Henry, JFB, Keil and Delitzsch, Robertson’s Word Pictures, Wesley, etc.) language references (Abbott-Smith, Strong’s dictionaries), and others (the old ISBE, Naves, Josephus, Calvin’s Institutes, Chesterton, Westminster standards). It also makes available the Emphatic Diaglott and the JST, both placed in the category of cult or unorthodox material. CrossWire has several applications, some of which are cross-platform programs, and each of which uses the same library. Xiphos runs on Linux and Windows; it can be used to create one’s own commentaries or other content. Eloquent, formerly called MacSword, is a program for use on OS X devices. FireBible is an add-in for Firefox on Windows or Linux. PocketSword is for use on the iPhone or iPod Touch. BibleTime Mini and a program called AndBible work on Android devices. These are just some of the many applications. Digital Bible Society’s online study tool, found on multiple websites, two of which are reviewed here. Can open multiple panes side by side with different texts or other resources. The BibleWebApp.com version has a select number of good English versions but no English translation of the Septuagint (LXX). Yet it does have the LXX in Greek, along with some standard Greek texts of the NT and Hebrew texts of the OT. The ebible.com version has translations in numerous languages; in English, included are the ASV, Brenton, KJV with Apocrypha, Douay, LXX 2012, NET, and others. The Greek text of the NT is available in the Tischendorf or SBL editions. The Hebrew text of the OT is available in the Masoretic (which I think means BHS) or the Westminster Leningrad Codex. The Greek LXX does not seem to be included. You can click on a word to search for it; the search includes translations of the word listed in Strong’s. The comparison tool shows at a glance the differences in wording of two versions. 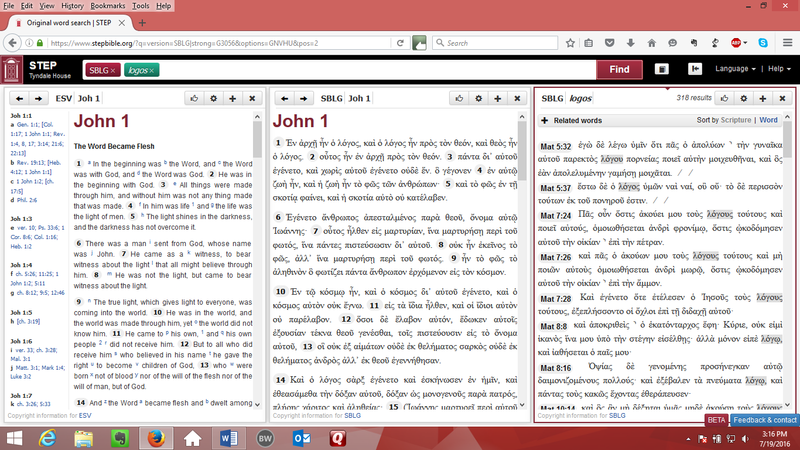 Free downloadable Bible study software, using public-domain resources. Available for PC, Mac, iPad, and iPhone. Impressive considering how much is free. A wealth of resources are made available for free; in many cases these are also available on various websites, but it is convenient to have them all in one program. After installing the basic software program, you can download free directly from e-Sword the Bible in several English versions (e.g., the ASV, Douay, ESV, and KJV) and some public-domain Greek and Hebrew texts, including the TR and WH GNT. The program performs word searches in both English and the biblical languages; you must use the text that shows the Strong’s concordance number for each word in order to do a search that includes all forms of the word (singular, plural, nominative, genitive, etc.). You can also search for exact phrases. The main window is divided into four panes: Bibles, commentaries, dictionaries, and editors. The editors pane may be used for creating sermons, study notes, journal entries, and the like. The company reports that the program has been downloaded more than 30 million times in 235 countries. From BibleSupport.com one may download thousands of free resources (Bibles, commentaries, dictionaries, etc.) for use with e-Sword; other premium references are available for purchase at eStudySource.com. There are introductory videos showing how to use the program. In addition, technical support is available through open forums on BibleSupport.com where one can ask questions and receive answers. Lumina, produced by the Biblical Studies Foundation, is an online study program that includes the NET Bible and its thousands of notes, along with the ESV, HCSB, KJV, ISV, Message, and NASB. Its parallel feature lists all of these along with the NIV and NLT. It also provides Hebrew and Greek texts of the OT and NT respectively. The program divides the screen into two panes, and whatever is on the right is kept parallel with the main reading pane on the left. Mouse over the English or original-language word and definitions are shown at the bottom of the screen (evidently from Strong’s dictionaries). You can read the Notes by Thomas Constable, essentially a commentary on the Bible. In addition to these good features, you can access the wealth of articles at Bible.org relating to whatever passage of the Bible you are reading, and (using the search function) you can preview journal articles related to the passage that are accessible through Galaxie Software (requires a $50/year subscription). App for Windows, Mac, iPad/iPhone, Android, and Kindle Fire; sync to all devices. Over 100 free books include several English versions (ASV, ESV, HCSB, JPS 1917, KJV, NET, NIV, NKJV, RV, and more), Greek NT texts (Byzantine, Scrivener, and SBL), the Leningrad Codex Hebrew Bible, the Vulgate, and a few older commentaries (Henry, Jamieson-Fausset-Brown). Compare texts or versions side by side, take notes, highlight and bookmark verses, choose a reading plan, and consult your reference library, for which you can purchase additional versions (e.g., NASB for $10), most study Bibles (typically $15 to $50 each; perhaps Olive Tree’s most impressive feature), commentary series (e.g., the 14-volume Pillar NT, $350), and other resources including maps, study tools (e.g., both BDAG and HALOT, $300), and books on apologetics, theology, and various subjects. If you want a lot of these additional resources, it might be better to go with one of the commercial software programs, as the cost of these resources purchased individually adds up. Recommended by John Piper, a very popular pastor and theologian. The STEP Bible (Scripture Tools for Every Person) is an excellent program that may be used online or downloaded for use in your browser even when offline. Produced by a team of biblical scholars at Tyndale House, a premiere center for study and fellowship for biblical scholars and educators, located in Cambridge (near the University though not part of it). Still in development, the program is already a robust and useful resource, with the Bible in multiple ancient and modern versions and a growing collection of commentaries (including such important ones as Keil/Delitzsch for the OT and Robertson’s Word Pictures for the NT) and other reference works. You can view transliterations of the original language words, do searches for words or multiple word forms in English (e.g., creat* to find create, created, creation, etc.) or in the original languages, do advanced searches for phrases and the like, search for topics, get grammatical information about each word, look up information about the usage of a word from reliable lexical references, see a word cloud that graphically shows the words that dominate in a particular passage, and more. Unlike most free programs, Step Bible comes with access to multiple editions of the ancient texts and versions (Hebrew, Greek NT, Greek LXX, and even the Samaritan Pentateuch, the Peshitta NT, and the Vulgate). This program comes closer than any other program to doing for free what BibleWorks, one of the leading commercial Bible study software programs, does. A completely free set of resources on the web, featuring a fairly extensive collection of public-domain resources as well as devotionals and weekly columns on apologetics, Christian living, evangelism, etc. English versions include the ESV, HCSB, KJV, NASB, NIV, NKJV, NLT, and NRSV; the only major contemporary English Bible that is missing is the NET. The OT can be read in three Hebrew texts (Leningrad, Aleppo, and BHS), in the Greek LXX, and in Brenton’s translation. The NT can be read in four Greek texts (TR, Tischendorf, WH with UBS variants, and Majority), but unfortunately not the current NA/UBS or SBL editions. Brief definitions of words are given from Strong’s and from BDB or Thayer’s. The Vulgate and the Peshitta NT are also available. Josephus and the church fathers are available in public-domain English translations. Search for a word or phrase; I have not yet figured out how to do so in Hebrew or Greek. Several commentaries are available (Calvin, Henry, Poole, Jamieson-Fausset-Brown, Keil and Delitzsch, and Robertson’s Word Pictures), along with the old ISBE and the Baker Evangelical Dictionary of Biblical Theology. A free Bible study program with optional add-on modules available for purchase. Primarily for PCs; not available as an app. The main English package includes several translations (KJV, ESV, HCSB, and NET), the TR Greek NT text, the Westminster Leningrad Codex Hebrew OT text, enhanced Strong’s dictionaries, Nave’s Topical Bible, etc. Paid modules are not inexpensive. Despite some good resources, overall I would not recommend this program for most users. One exception: Evidently theWord has an exceptional library of Bibles in foreign languages, which might prove invaluable to missionaries and pastors in those countries. Biola University’s biblical study tools website, with a word search program, a Greek lexical parser, the old International Standard Bible Encyclopedia and other public-domain resources, a harmony of the Gospels, biblical maps and art, and more. Look up, compare, or do word searches in any portion of the Bible in 11 different English versions, Greek, Hebrew, Coptic, Latin, and several modern languages. Look up Greek or Hebrew words (which must be transliterated or typed with the appropriate “keyboard”) in a lexicon. The site does not appear to have been updated in nine years. HCSB with parallel versions (notably the ESV, KJV, NASB, and NLT), the ability to highlight, bookmark, or annotate the biblical texts, a word study tool (that uses Strong’s numbering system), and a searchable “library” of links to commentaries, dictionaries, and other resources. The basic program is free, but most of the “library” resources require additional purchase.